Picture an event more reminiscent of a hobbit than a Hemingway; not containing enough adrenaline or alcohol to inspire a memory of Pamplona or allow use of the word stampede. 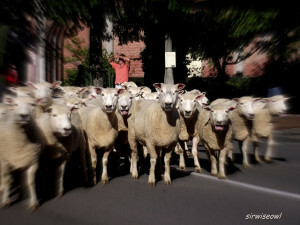 Three hundred dry merino sheep move through the streets of Queenstown, New Zealand, in a quick but relatively orderly procession. Fifty rams mixed in keeps just that hint of danger. Barriers line the route to keep the chances of any bloody fool sustaining bodily injuries to a minimum, but I would think the chances of slipping while trying to cross the street right after it’s over are about 50/50. In the long-gone old days, this would just be called taking the sheep to market. In today’s world, where people have no clue where wool comes from; it’s a world news event called The Running of the Wools. 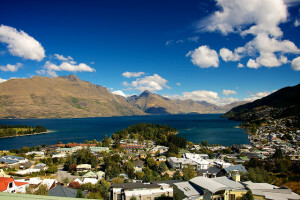 Founder Steve Hollander started this event to help people remember and celebrate the things that built Queenstown. He assures me that the first time was a great success and the sheep will run again next year. This soon-to-be annual procession is part of the Hilux NZ Rural Games, which takes place in early February over the Waitangi Day holiday weekend. A quick check of their website shows the other events planned to give the visitor many things to see once the sheep have gotten to where they’re going. Serious competitions listed with the word speed in front of them included coal shoveling, sheep shearing, hand milking (cows), tree climbing, tree chopping, fencing (building), and gold panning. Events judged by distance include the traditional Highland heavies-the caber toss, stone, sheaf toss and farmer’s walk as well as the lighter cherry pit spit and gumboot throw. Slower precision events include the egg toss and, of course, there are sheep dogs herding lots of sheep. I know it’s a long long way to go for a field trip, but if next February gets to be as cold as it was here this February, witnessing the Running of the Wools might be just enough excuse to visit somewhere where it’s naturally Summer during that time of the year. It looks like Queenstown is a pretty place, and they have lots and lots of beautiful soft merino. I wonder how much one can cram into a carry-on?